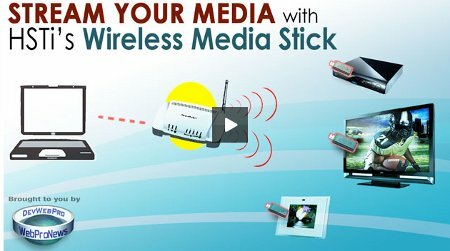 Media streaming is catching on these days, and the HSTi Wireless Media Stick is one of the latest devices from this line of gizmos to hit the market, where it enables users to stream media files from any computer that is hooked to a wireless network to virtually any USB-enabled device, be it a TV, gaming console or even stereo system. Setting it up is a snap – all you need to do is plug in the Wireless Media Stick into any available USB port on a computer, and the device will load the setup software automatically. Being part of your wireless network, it will wirelessly transfer and stream media via a 802.11a/b/g/n Wi-Fi connection. Since it is USB-powered, there is no need for any additional batteries or external power supply whenever you tote this $119 device around. This is a great device. I use it nearly every day in my home. I have a tv with a usb port, and a dvd player with a usb port. Moving the stick between the two is a snap, and the stick turned each of my devices into a wireless device. Apparently it also works on Macs now too..! Awesome stuff HSTi! Now compatible with Mac too. I love mine!!!! I’m shocked that this hasn’t been picked up by Sony or some big player.